Having granite countertops outside allows you to entertain with a beautiful backdrop, especially when having guests over for an outdoor meal. However, if you are only used to having granite countertops inside, then learning how to protect them while outdoors may be a bit foreign to you. Most of the process of cleaning your granite countertops is going to be the same, but there are a few considerations to make sure you keep in mind. Granite countertops can bring a new level of class and sophistication to an outdoor eating area, but you need to make sure that you plan accordingly when figuring out where to put your outdoor kitchen. You do not want your granite countertops sitting in the direct sun, so you want shade over them, but you also need to protect them from nature. If you put your granite countertops below a large lot of trees, then you will get the shade you need to make sure you do not dim the color or finish of your counters, but you will then have to consistently be going outside to wipe and clean them off. Leaves that fall off of trees can stain your granite countertops if left there for extended periods of time, so if you do not plan to use your outdoor kitchen, you should cover each of the elements to protect them. You also need to keep another thing in mind if you use trees to shade your granite countertops. There are many different animals that live in trees, so on top of cleaning up the leaves, you will also have to go out and clean up animal droppings on a regular basis. Again, putting a cover over your granite countertops can help, but you should still expect this at least now and again. The other option is putting some type of an umbrella, pergola, or column-supported roof over your outdoor kitchen to keep it shaded and safe. Since Denton, Texas rarely sees hard frosts, most people do not worry about it, but if you are worried that your granite countertops will crack if the weather gets too cold, you shouldn’t fret. When granite countertops are installed properly, there is almost no chance of them cracking due to cold weather. Keep in mind, granite comes from the ground, so it is used to the changes in weather from when it was formed. Many people like having citronella candles or oil lamps burning when they are using their outdoor kitchens, as that helps to keep the bugs at bay, but this must be done with extreme caution. Candle wax and citronella oil can both cause damage to the finish of your granite counters, so you should avoid putting them down on your counters without anything under them that is big enough to catch any wayward drips. You should also avoid putting anything on your granite countertops that could rust, as that can scratch the surface of the counter. These should only be set down with something beneath them as well. A paste of baking soda and water can get mild rust off should you encounter some, and commercial products like Iron Out can help for deeper stains, but you should make sure to only use gentle bristled brushed should you have to get any rust off of your counters. When winter weather has passed and you are going to be outdoors using your granite countertops regularly again, you will want to make sure that you clean up your counters before their first use. Normally you would clean your granite countertops with a very mild soap and water, or just use water on its own. However, immediately after removing the cover from your granite countertops, you should only use water without soap. Rinse off the surface and make sure to wipe up any debris that is left behind. From there, you can use a mild soap to clean up anything that remains, and your granite counters should be good to go. If you do not want to go through the hassle of maintaining your outdoor kitchen, or if you have not even installed it yet, but want to this season, then you should give the professionals a call. 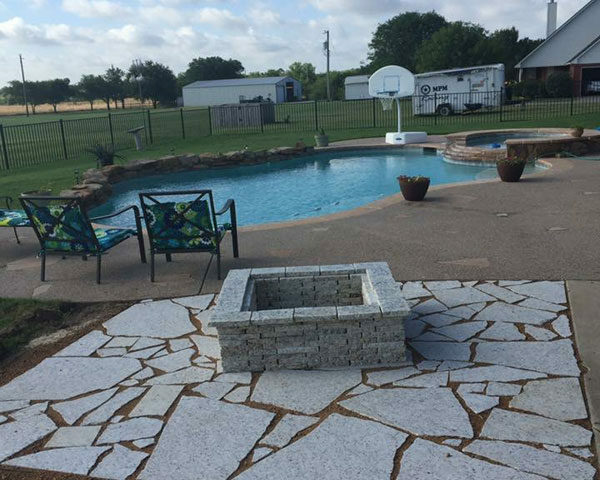 They can help you when it comes to setting up the outdoor kitchen of your dreams, maintaining your outdoor kitchen, or even sealing your countertops to protect them from the wear and tear that the Denton, Texas sun can put on anything left outdoors. If you want help with your granite countertops, call Granite Huggers at (972) 670-4533 today and let them know how they can help!